SuperValu, the biggest food distributor in Ireland, told the Irish media last week that it has withdrawn Israeli products from its shops. And Israeli media reports suggest that other major European retailers have taken similar decisions without announcing them publicly. Israeli fruit and vegetable exporters have faced cancelations from Scandinavia, the UK, France, Belgium and Ireland. Retailers have become fearful of the rapidly growing consumer boycott of Israeli goods, according to an 11 August article in Hebrew business website The Marker. I’ve heard of major exporters from whom chains in southern France are no longer buying. There is no official boycott, but everyone is afraid of selling Israeli fruits. We can only hope that things do not get worse. Among the other exporters interviewed for the article is an Israeli pomegranate grower who is quoted as saying that they had been forced to cancel their “entire work plan in the UK” because major retail chains were no longer interested in Israeli goods, and that similar messages had been received from importers in Belgium and Scandinavia. A separate article published in The Marker on 27 July details how fruit juice producer Priniv had lost a major contract with a business in Sweden after refusing a request to export the produce in a way that would make it easier to conceal the fact it was produced in Israel. Customers in Belgium and France also made similar requests. Priniv director Ido Yaniv attributes the drop in sales to Israel’s attack on Gaza. Organized boycott, divestment and sanctions (BDS) campaigns have in recent years succeeded in pressuring retailers across Europe to announce that they will not stock produce from illegal Israeli settlements or from companies that operate in settlements. The Tesco chain the UK is the latest to make such an announcement. But it is now becoming increasingly clear that European businesses are starting to react to growing public support for Palestinian rights and boycotts of Israel in Europe. They are deciding not to sell Israeli produce of any kind — at least for now. Ireland’s largest grocery and food retailer distributor SuperValu instructed all of its 232 stores to remove Israeli products from the shelves earlier this month. “It’s mostly fruit and vegetables, carrots and herbs more specifically,” a source from the retailer told the Irish Herald. Following the Irish Herald story, SuperValu issued a statement saying that it has not officially endorsed the boycott of Israel but did not deny that Israeli products have been removed from its stores. Major Irish toy store Smyths may have taken a similar decision, temporarily displaying a poster at one Dublin store stating that it had removed products made in Israel from the shelves. The decisions come as part of a huge upsurge in support of the Palestinian struggle and boycotts of Israel across Ireland. Protests have been held in retailers across the country and calls for boycott have been made by national trade unions, local councils and even sports stars including Irish and Leinster rugby star Gordon Darcy. Calls for boycotts of Israeli products, for sanctions and a military embargo to be imposed on Israel have been a key part of the huge mass demonstrations in solidarity with Gaza that have taken place across the world in recent weeks. Civil society organizations are responding to the attack on Gaza by announcing new boycott initiatives. In the weeks and months that follow, the challenge for campaigners will be to ramp up the pressure on retailers to remove Israeli products and to make their refusal to do so public. 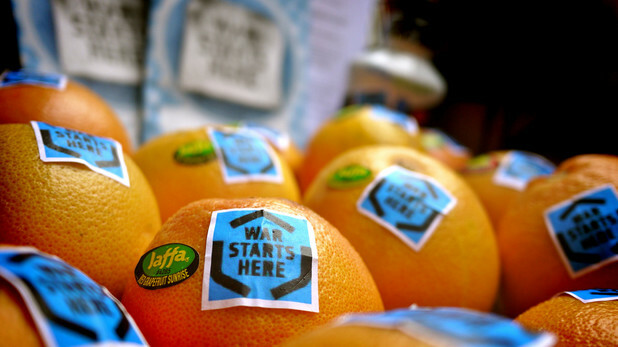 Campaigns against the sale of Israeli fresh produce have been a major focus of the solidarity movement in Europe in recent years. BDS initiatives have focused on Israeli companies such as Mehadrin and EDOM that play a key role in the colonization of Palestinian land in the West Bank and profit from the siege of Gaza, as research published by Palestinian farming unions has detailed. In January, Israeli settler leaders in the Jordan Valley region of the West Bank told the Associated Press that the boycott, divestment and sanctions campaign had cost settlers $29 million in lost sales, especially in Europe. Campaigns against Israeli fresh produce exporters have intensified following the decision by the UK Co-operative retail chain to boycott all companies that operate in settlements, with campaigns also underway in France, Spain, Belgium, the Netherlands, Germany, Norway and Sweden. In 2011, Israeli export company Agrexco entered into liquidation after boycotts and campaigns in thirteen European countries that saw retailers cut links with the company, blockades of its UK and Belgium warehouses and a huge mobilization against plans for an Agrexco distribution center in Sete in the south of France. Israeli analyst Shir Hever suggested at the time that farmers leaving Agrexco to export their products through other channels because of the boycott campaign was a major factor behind the company’s collapse. With thanks to Boycott From Within for translation from Hebrew. There was a story, printed without confirmation by The Herald, that turned out to be completely incorrect. SuperValu unfortunately have NOT dropped Israeli produce. Double check your sources. It's very obvious if you read between the lines though; they're just being 'diplomatic'. Its not official, they denying there is a boycott due to fear of Israeli Zionist lobby, at the same they have enough at stock not to buy from Israel. Get it? I think the SupaValu statement to the Irish Times is very interestingly worded. While they deny having officially endorsed the boycott, they do not deny having ordered the removal of at least some Israeli products from their shelves or that a notice was issued to its stores. It seems like a very carefully worded statement to me that doesn’t contradict the crux of the Herald story. Damn u Hamas... oh wait a minute, the West Bank is ruled by Fatah... or what's left of it. Damn u Fatah! What is required is not only a boycott of West Bank goods, but all Israeli and American goods. America is Israel's main backer. There are many substitutes that can be purchased from China, India, Russia, South America, South Africa, Turkey, Indonesia,etc. Proud of the European businesses and common people for standing up and boycotting products from illegal Israeli settlements and set an example for everyone how to act when innocent kids are butchered without any respect for any international laws. The Advent of social media has brought the crushing reality of the israeli occupation to mass population. A boycott is inevitable when people see 13 year girls get sniped, see the results of 239lb bombs dropped on densely populated areas, see 9 year olds playing football on beach get blown to smithereens. I noticed grapefruit in my NY supermarket that was from Israel several months ago and I complained to the produce manager. America has grapefruit grown in California and in Florida and I asked that the store stock American produce and not produce from Israel. He listened and now there is no Israeli produce in the store. Anyone can do that. I complained about Israeli olive oil in specialty store and it is no longer there because when I asked if the oil were produced actually from Palestine's occupied territory the shop owner could not answer. I have complained about shops carrying Israeli made hand creams and bath products and had shop owners tell me several people had raised the same complaint so they would no longer carry the products. Boycotting on a small scale works if everyone does it. Read labels. Do not but Made in Israel. Don't buy Gap t-shirts made in Israel. Don't buy anything made in Israel. Stores should be proud not to sell Israeli products. This shows genuine opposition to the slaughter of civilians in Gaza that everyone with a brain now knows was intentional. No person with a conscience should buy ANY Israeli products until it ends the blockade of Gaza and withdraws All settlements from the land it seized, and until it offers total and complete equality to non Jews in Israel itself. This is a moral imperative. Only this might turn Israel away from Judeofascism that has taken over the nation and turned it into a killing machine of Palestinian women and children and unarmed protesters as the vast majority of it's citizens cheered the slaughter. Boycotting Israeli products mean saving thousands of lives! Israeli's hostilities cannot be stopped without boycotting its products publicly by all peace loving people around this globe. US Products should be boycotted too as it is supplying weapons to Israel to lengthen the war and kill all Palestinians. It is not important whether this report is true or not. The most important thing is to boycott Israeli made products or pseudo Israeli products from US and other allies. The economic sanction through boycott of Israeli products could be considered as a peaceful, non-violent and very effective way of expression against Israel's inhumanity, hostility and genocide of Palestinians. I NEVER buy Israeli goods, due to the long-standing situation in Gaza and their opposition to a two-state solution. While, I am usually careful and check barcodes plus country of origin, if I find I accidentally purchased an Israeli item, it goes straight into the bin. I generally don't buy any fruit/veg without a statement of where it came from on the label. Solidarity friends! Does anyone know the barcode for Israel products? Israel's barcode is 792. But be careful, sometimes their produce is packaged elsewhere: for example in the Netherlands/Holland where I think the barcode is 871, but it will still say, or at least should say 'produce of Israel'. We actually discovered some dates a couple of years ago in a large box which had Koranic text on the box, and said 'packed in France'. The giveaway was the company name: Mehadrin. Any dates which say 'Jordan Valley, Jordan Plains' etc are NOT produced in Israel, but in the belligerently occupied Jordan valley; you sometimes have to learn the names of the companies, because they know that Israeli dates are being targeted. Good luck. There is an app called "buycott" that will help identify where products are made. No no they haven't! They withdrew some products. Not all. Still stock Loreal, Garnier and many more. Shouldn't products from Jaffa be boycotted? Jaffa was part of the proposed Arab State according to the UN Partition Plan, but in April 1948 the Jewish terrorist group, the Irgun, used mortars, and continuously shelled the southern neighbourhoods of Jaffa for four days causing the Arab inhabitants to flee in panic. The Conquest of Jaffa by the Irgun was the largest in the history of the organization, taking place in highly built up area that had many militants in shooting positions. During the battles explosives were used in order to break into homes. So products from Jaffa, Israel, are off my shopping list. Fortunately, McVitie's entire line of Jaffa Cakes are produced in the United Kingdom at the McVitie's factory in Manchester/Stockport. In response to your correspondence, I would like to take this opportunity to clarify our position in relation to sourcing Israeli goods in light of recent reports. We believe that shoppers will make their own purchasing decisions and as such we do not take a position on international affairs that may influence these decisions. Given this policy, we are not engaged in a boycott of Israeli goods. Our policy is to source from Ireland wherever possible and 75% of everything in store is produced or sourced in Ireland. When a product is not available in Ireland, there are occasions when we are required to source goods from further afield in order to meet customer demand. We prioritise sourcing from the UK and Europe, when an Irish product is not available. Very occasionally, a small number of products are sourced from Palestine, Israel and other markets when we cannot get sufficient supply from our priority supply markets of Ireland, the UK and Europe. We currently have sufficient stock from our priority supply markets with no goods ordered from Palestine and Israel at this time. I hope this provides clarity in relation to our position. I think communication with retail outlets is as important as outright boycotting, often the workers are boycott supporters where their bosses might not be. In the case of Smyth's Toys when I queried them they confirmed they were not stocking Keter products but ordered other Israeli goods put back on their shelves after workers at one store removed them. I also wonder if it's possible to get small independent stores to stock Palestinian goods? Thinking www.gazaark.org. Peace.